Whether they come to Palm Springs as tourists, second-home owners or full-time residents, fans of “the Springs” all love it for the same reasons: its dazzling collection of Mid-century modern architecture, its perfect setting at the foot of snowcapped 10,831-foot Mt. San Jacinto, and its intimate, small-town atmosphere combined with world-class art, music, film, dining and recreation. Incorporated in 1938 and today home to about 47,600 year-round residents (about 75,000 in the winter), 96-square-mile Palm Springs is part of California’s “high desert” ecosystem, 487 feet above sea level and 107 miles east of Los Angeles. Boasting some 350 days of sunshine and spectacular vistas, the city is an easy two-hour drive from Los Angeles, Orange and San Diego counties, making it a popular recreation center for generations of Californians. Now conveniently served by Palm Springs International Airport (PSP) and world renowned for its cultural attractions, this small desert town is more appealing than ever. Every January in the run-up to the Academy Awards, Palm Springs rolls out the red carpet as home and host to the hugely popular Palm Springs International Film Festival. During its 26st anniversary season in 2016, the festival will include more than 400 screenings of some 200 films from approximately 60 countries. In June, local screens light up with the Palm Springs International ShortFest. Among the many other highlights of Palm Springs living: VillageFest, every Thursday night along Palm Canyon Drive, with residents in the know clamoring for early reservations for front-row dining (and people-watching) at local restaurants, and throngs of neighbors strolling among booths that sell food and handcrafts; Modernism Week, every February, which celebrates mid-century modern architecture, fashion, furnishings, jewelry, and other collectibles; the 15-minute, 8,500-foot ride on the Palm Springs Aerial Tramway; more than 130 hotels and motels, from modest bungalows to historic bed and breakfasts to lavish resorts; convenient desert and mountain hiking, biking and horseback riding; fantastic golf options with numerous challenging greens; exceptionally clear air; picturesque palm trees; the Palm Springs Art Museum, one of the outstanding mid-size art museums in the country, which features major exhibits, music, theatre, dance, film, classes and other activities year-round; wonderful shopping, from vintage to contemporary; and of course, Palm Springs has a delectable assortment of dining options for every taste and budget. Ready to take a plunge and claim your own Palm Springs Condo or Home? Know the details that you ought to know before you buy any condo or home for sale in Palm Springs. 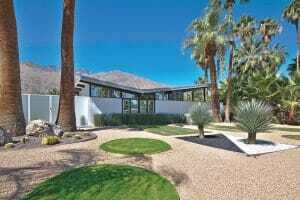 Search for Palm Springs Homes Now Who’s Buying Palm Springs Condos For Sale?